Segovia - after Toledo, SEGOVIA is the outstanding trip from Madrid. A relatively small city, strategically sited on a rocky ridge, it is deeply and haughtily Castilian, with a panoply of squares and mansions from its days of Golden Age grandeur, when it was a royal resort and a base for the Cortes (parliament). It was in Segovia - in the unremarkable church of San Miguel, off the Plaza Mayor - that Isabel la Católica was proclaimed queen. For a city of its size, there are a stunning number of outstanding architectural monuments. Most celebrated are the Roman aqueduct , the cathedral and the fairy-tale Alcázar, but the less obvious attractions - the cluster of ancient churches and the many mansions found in the lanes of the old town, all in a warm, honey-coloured stone - are what really make it worth a visit. Just a few kilometres outside the city and reasonably accessible from Segovia are two Bourbon palaces, La Granja and Riofrío. Inside the city are important medieval and Renaissance buildings, such as the Casa de los Picos, the Corn Exchange or the Tower of los Lozoya. On our way to the Plaza Mayor and the Cathedral, called "the grand lady of cathedrals", don't miss the Medina del Campo square, the church of San Martín, where Mozarab, Romanesque and Mudejar elements are spread around the series of arches and capitals. The old Segovian Jewish quarter must have been in an area near the city walls since the Convent of Corpus Christi is built over a former synagogue. San Miguel, incidentally, was the place chosen for the coronation of Isabel the Catholic Monarch as the Queen of Castile. Buy at AllPosters.com A short distance away from the arcaded Plaza Mayor we find one of the last gothic buildings to be constructed in Spain, the Cathedral. Started in the XVI century in flamboyant Gothic, in its execution are some pieces of the old cathedral such as a gothic Hispano Flemish cloister, the choirstalls and the main façade. More recent additions are the San Frutos gate, the apse, the high reredos (a work by Sabatini in the baroque style) and the Neoclassic retrochoir by Ventura Rodríguez. In the side chapels we can observe sculptures by Juan de Juni and Gregorio Hernández. These names belong to some of the greatest craftsmen of the Spanish baroque and neoclassic periods. The Cathedral Museum also offers us a large collection of religious art from various periods of history. 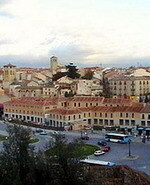 The los Caballeros quarter is also inside the city. Here you can find luxurious large houses and palaces belonging to noble families such as the palaces of Floresta, Count Cheste or Uceda-Peralta. Numerous Romanesque churches can be found in this quarter, such as the church of San Juan de los Caballeros (which houses the Zuloaga Museum), San Nicolás (now the Municipal Theatre Workshop) or San Esteban, a XIII century building whose tower and atrium are one of the jewels of late Spanish Romanesque. Among the beautiful displays of medieval military architecture, such as the Hércules Tower and the Arias Dávila Tower, is the church of la Trinidad, one of the best preserved vestiges of Romanesque in the city. At one end of this walled enclosure is the profile of the Alcazar fortress behind the Queen Victoria Eugenia gardens (this is where the old cathedral was located). On the outside is the impressive group formed by an 80 metre high tower with twelve more smaller towers, and a moat for defence. Several courtyards, halls and rooms can be visited, and you can even go up to the top of the crenellated tower and admire the Segovian landscape. Any point in the province is a good place to try Segovian cusine. La Granja broad beans, Castilian soup (made from garlic and bread) and roast lamb and suckling pig, are added to calderetas (meat stews) and game dishes. Cantimpalo spicy sausage is well known as is ponche Segovian (a typical cake). Designation of Origin wines from the Ribera del Duero will accompany these delicious dishes. The restaurant at the Parador in Segovia offers us a wide menu from which we can try some of these dishes, prepared in a wood oven. Its modern facilites offer us one of the best views in the city. About the Author - Marketing intern at Barcelonapoint. The Eurostars Plaza Acueducto is a stylish, contemporary hotel occupying a classic honey-coloured Castilian building in Segovia's old town, in front of the famed aqueduct and 500 metres from the historic Cathedral. The hotel is in an excellent position to explore the surrounding area; the 15th-century Casa de los Picos, St Martin's Square, St Lorenzo's Church, and the Cathedral can all be found within 700 metres. Guests can relax in the stylish, modern ambience of the air-conditioned public areas, enjoy a drink or snack from the café-bar, use wireless Internet connections, and work out on the fitness equipment. The 72 modern guestrooms, over four floors, feature neutral decor with coloured fabrics in muted shades, parquet flooring and contemporary furnishings. The Hotel Alcazar is located in the World Heritage city of Segovia surrounded by wonderful natural landscapes. Set in a 17th century building, its stones walls, granite and marble columns, wooden beams and impressive glass windows, contribute to the warm and intimate atmosphere, that guests breath as soon as they arrive. Due to its strategic location, stunning views of the city, and historic buildings can be observed from its windows and balconies. Antiques, works of art and regal furniture decorate the spacious and elegant lounges. The exclusively decorated and spacious rooms which have been named after important queens of the Segovian history, are filled with plenty of antique details blended in perfect harmony with the added modern facilities. Hotel San Antonio El Real is located in the historic Spanish city of Segovia, 500 metres from the Roman Aqueduct and one kilometre from the Cathedral. This two-storey hotel is housed in the cloisters of a former monastery from the 15th century. The air-conditioned public areas have complimentary wireless Internet; laptop and mobile phone rental is available. Cars can be parked securely nearby complimentary and there are laundry facilities. 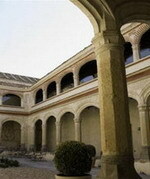 Hotel San Antonio El Real Cloister Restaurant serves Castilian specialities in a historic setting. Guests wake up to a complimentary buffet breakfast each morning. Guests enjoy complimentary use of the hotel fitness centre. The Hotel Husa Puerta de Segovia is housed in a modern, four-storey building sited two kilometres from the historic centre of Segovia. On sunny days, guests can enjoy a dip in the outdoor pool. In the evenings, guest can enjoy a range of Mediterranean and international dishes in the Puerto de Segovia Restaurant. Complimentary newspapers are provided in the lobby and public Internet access is available for a charge. Multilingual staff at the front desk can exchange currency and store valuables in the safe-deposit box. Other practical amenities include shoe-shine and dry-cleaning services and laundry facilities. The 205 guestrooms have neutral decor and functional furnishings including desks. Parador de Segovia Modern, welcoming and surprising, this Parador rises up in one of the most monumental cities of Spain, declared a World Heritage Site. From it can be seen the best panoramic view of Segovia. It is moreover an ideal setting to approach the numerous natural spaces of the province. The bedrooms of the Parador are spacious and comfortable, and enjoy splendid views of the city, as does the dining room and the outdoor swimming pool. The very spacious lobby displays modern paintings and design elements, in clear contrast to the simple, circular lines which frame the heated swimming pool. The splendid conference centre stands out, with several living rooms and congress rooms, and the dining room, an extensive display of regional products: 'judiones de La Granja' (beans), Castilian soup and roast lamb or suckling pig in a wood-fired oven. 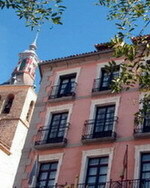 The Sercotel Infanta Isabel is located in Segovia, Spain, within 50 metres of the 16th-century cathedral and San Miguel church. 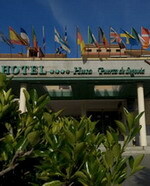 The hotel lies five kilometres from Guiomar train station where the high-speed Madrid-Segovia line passes. Overlooking the town square, this 19th-century building, spread over five storeys, opens to plush interiors with gilt-framed mirrors and floral sofas. A spa tub can be found on the top floor and there is a lounge bar. Meeting rooms can cater for up to 50 delegates theatre-style, or 65 people for a banquet or cocktail party. Parking is provided for a surcharge. Restaurant Casares serves regional dishes and tapas in modern surroundings with dark wood furnishings and parquet floors.